A heart wrenching exhibit near Ground Zero geographically displays the power of the first atomic bomb used in wartime. Although located 420 miles west of Tokyo, the city of Hiroshima is today a tourist mecca, drawing tens of thousands of visitors from around the world for one single reason: to stand at the epicenter of history’s first nuclear explosion used against an enemy population. Hiroshima is a sobering experience. Most of the city was obliterated in a blinding flash at 8:15 am on August 6, 1945, and—except for the skeletal remains of one building and a park and museum dedicated to the memory of those who perished—there is virtually nothing left to remind visitors of that awful day. The stark, derelict remains of the former Hiroshima Prefectural Commercial Exhibition Hall, now known as the Genbaku, or “A-Bomb Dome,” stand as a visible reminder of the horrors of nuclear war. But the solitary building’s ruins and the silent, horrific exhibits in the museum are more enough to evoke a flood of emotions (on the day I visited the museum, I saw a teenaged American girl weeping uncontrollably). Other visitors just stand quietly in front of exhibits that demonstrate the effects of the bomb’s power—warped steel girders, melted children’s toys, scorched clothing, and pieces of stone and metal scarred by flying glass—or view a film that graphically shows the terrible injuries suffered by those Hiroshimans who weren’t killed outright by the blast. 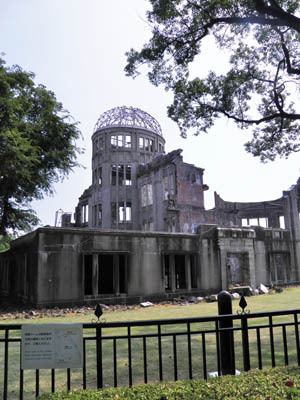 At the other end of a long memorial park, there is the enduring symbol of Hiroshima and atomic destruction: the Genbaku (Atomic Bomb) Dome, as it is now called. Built in 1915 as the Hiroshima Prefectural Commercial Exhibition Hall, the building had been used as a trade center and a place for art exhibitions, fairs, and cultural events. Located only 150 yards from the spot where the bomb exploded, the building along the banks of the Otagawa River was shattered and set on fire. Yet, somehow, much of the brick-and-concrete structure remained standing. After the war, its burned-out shell was stabilized and left in place as a memorial to as many as 140,000 people (no one is sure of the exact number) who died on that fateful day—a day that surely changed history. 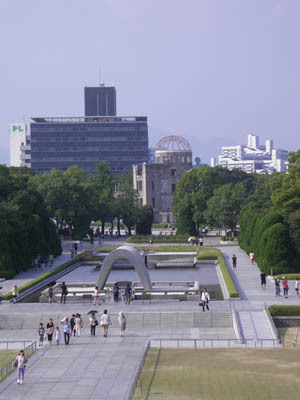 A view of the Hiroshima Peace Memorial Park, with the Genbaku, or “A-Bomb Dome,” in the distance. Today, Hiroshima is a modern, vibrant city. Yet its name will be forever linked to one of the greatest tragedies of World War II. 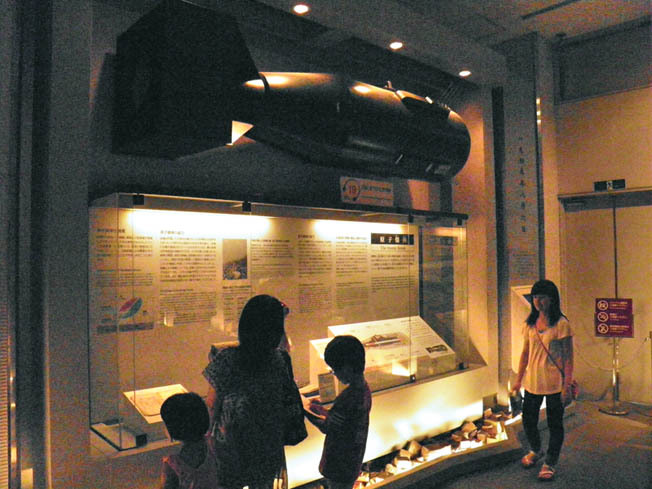 A full-size replica of the “Little Boy” atomic bomb is suspended above a display case in the Hiroshima Peace Memorial Museum. Tags Allies, atomic bomb, Axis, Hiroshima, Hiroshima Peace Memorial Park, POW, Tokyo.